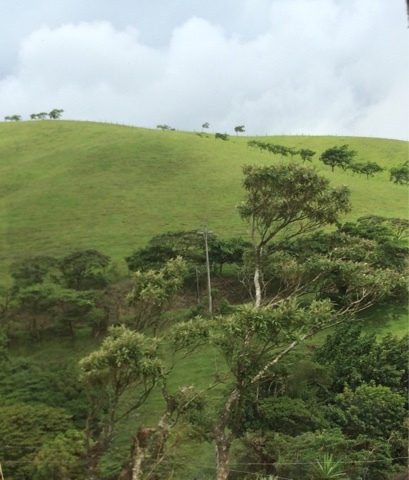 Saturday: We Made it to Monteverde! My day began early at the Arenal Montechiari Hotel. I was up by 5:30 and decided to get some exercise while others were still sleeping. I took a quick jog into town to see if anything was open, but La Fortuna de San Carlos was still asleep at 6am on this cloudy Saturday morning. After doing a few laps around the town square, I returned to the hotel to pack, shower and eat breakfast with the crew. 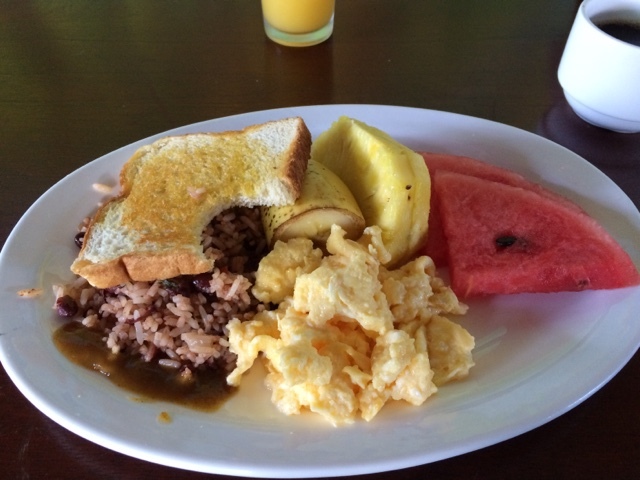 The staff prepared another delicious breakfast for us, but they eliminated the papaya slices due to having too much yesterday. That was a bummer. Oh well, pura vida. 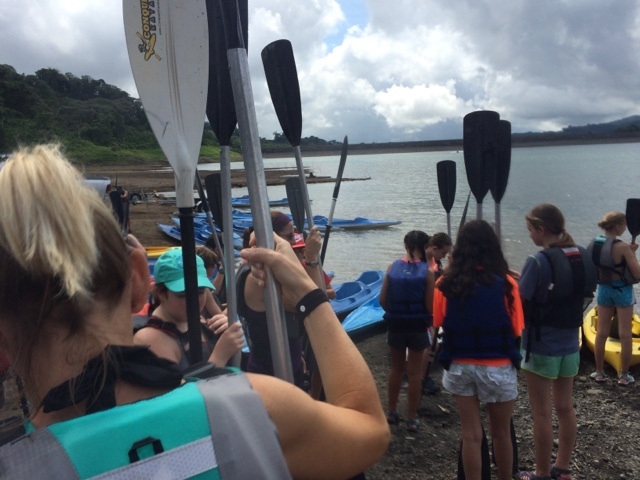 We made the short drive to Lake Arenal where we began our kayaking adventure. 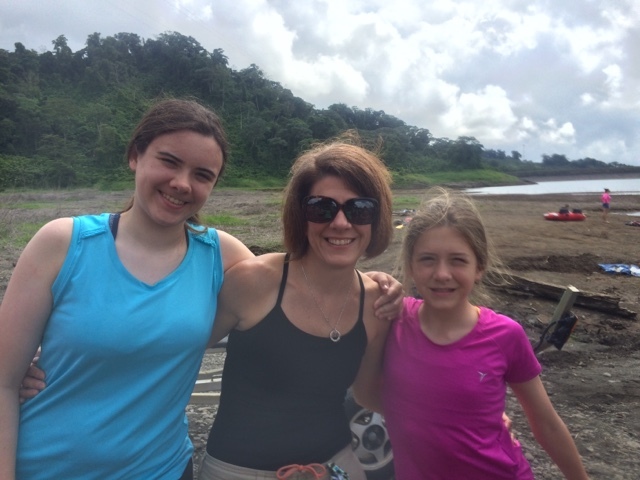 The girls rode with friends and I rode with another chaperone. We all got a little wetter than we had hoped as the rain moved in, but the kids had fun and I enjoyed the peace and tranquility of the lake. 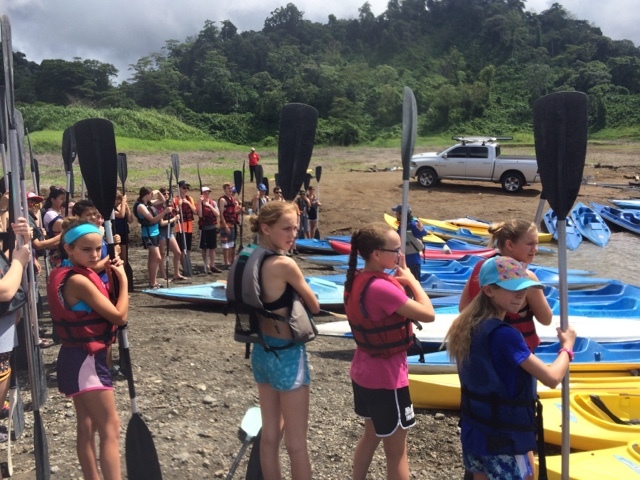 After an hour of kayaking, we changed (well, some of us did) into dry clothes and boarded the bus to Monteverde. We were told that this was a 4 hour trip with the last 20 miles being an all dirt road that takes 2 hours to drive. We all dreaded this, but knew it would be worth it based on the things we had heard from our tour guide. Knowing that lunch was at least another 4 hours away, I was glad that I had packed two huge bags of a tasty snack mix to take from place to place. I wanted to bring something sweet and salty with protein a a fiber that wouldn’t melt or get sticky. Oh yeah, it had to include things that all three of us would eat and it couldn’t include things that would turn to crumbs if smashed. Here’s what I included: oat square cereal, pretzel goldfish, whole grain goldfish, raisins, peanuts, pumpkin seeds and craisins. I know it’s nothing earth shatteringly new, but I was unable to find any store bought trail mixes that met my needs. Most commercially prepared trail mixes have far too much sugar, chocolate or ingredients that don’t appeal to my girls, so this was our solution. We are on day four and it is still fresh and helpful! 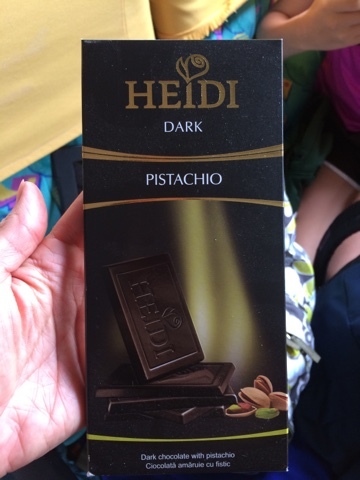 That didn’t stop me from picking up a bar of dark chocolate (Heidi brand) at a small German bakery on the way up the mountain. 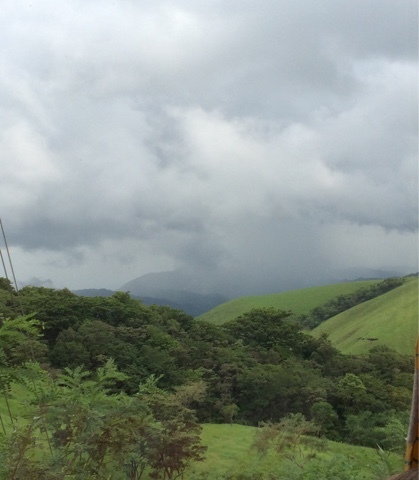 The views of the countryside as we climbed the mountain were spectacular. With about ten miles of dirt road to go, our bus broke down. 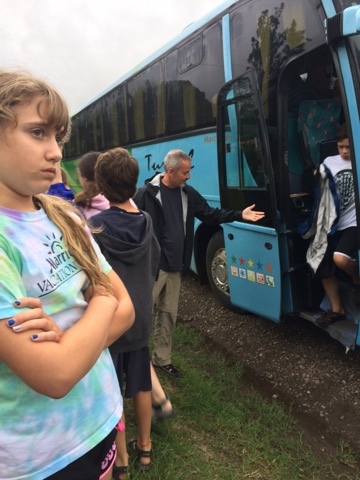 We all evacuated the bus in the rain and waited on the roadside to see if the driver could repair it. Knowing that it be at least 24 hours before another bus could come to rescue us, we waited and many prayed that this would be just a little bump in the road. Pun intended. 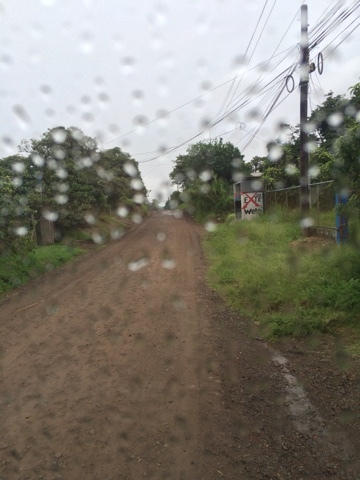 A ten mile hike up a mountain on a dirt road in the rain was not something that was included in our trip fee. Blessedly, Elmer had the replacement part he needed for the bus. 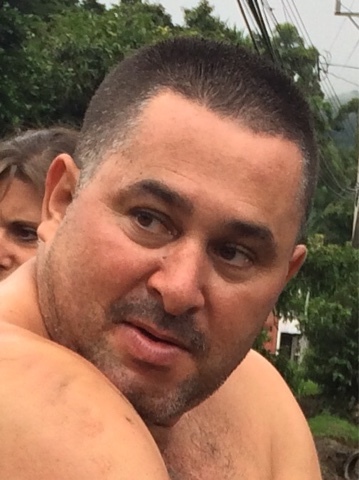 After wiping him down with wet wipes to get the grease off, we were back on our way to Monteverde. Elmer is the true MVP of this trip! The reaction of the kids when we had to evacuate in the rain. Trying to put a smile on the whole situation. 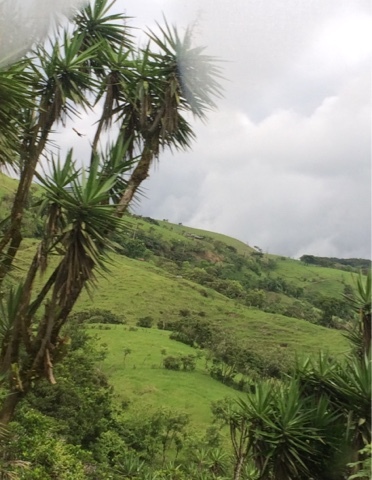 We arrived at our hostel, the Santa Elena Hostel Resort (the word resort is a bit of a stretch) and had a quick lunch of chicken with salad. It was nice to see something green other than guacamole. This hostel has 17 rooms so we are basically the only ones here other than some Australian travelers. The rooms are very, very basic and it feels more like camping than a hotel. The kids are adjusting fine, but I have to admit that at the end of the day, I really don’t want to have to worry about bugs while sleeping. In addition to that, I actually like the feeling of having dry clothes, a dry towel to use after showering and dry socks. I don’t ask for much, but I’m starting to think I will never be fully dry again! While waiting for dinner, the kids and I walked through town to look at souvenirs. We caught up on some emails in the hostel office. There is no Wifi in the rooms. We enjoyed pasta for dinner and then made our way back to our rooms for an early night. 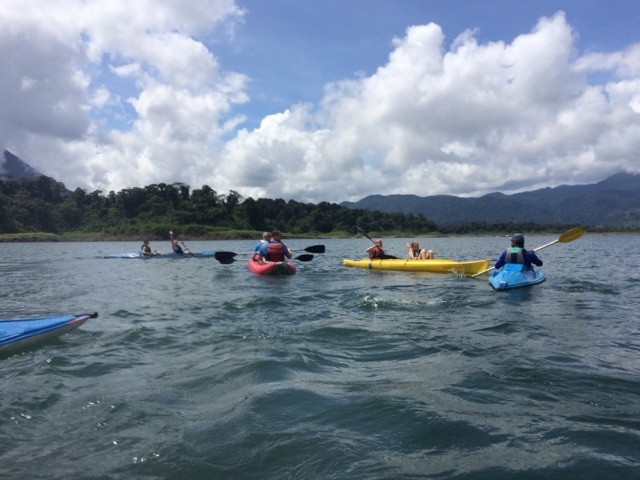 All in all, a fun day in Costa Rica. 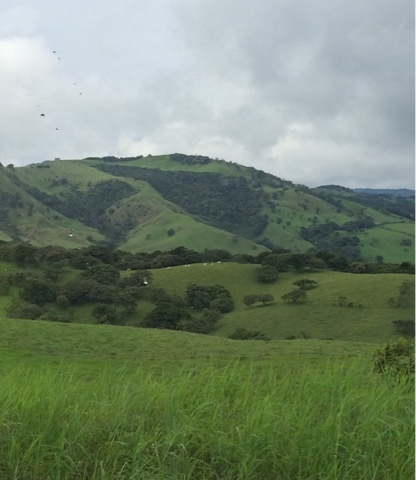 Tomorrow, we will be ziplining and hiking in the Santa Elena Ecological Reserve. 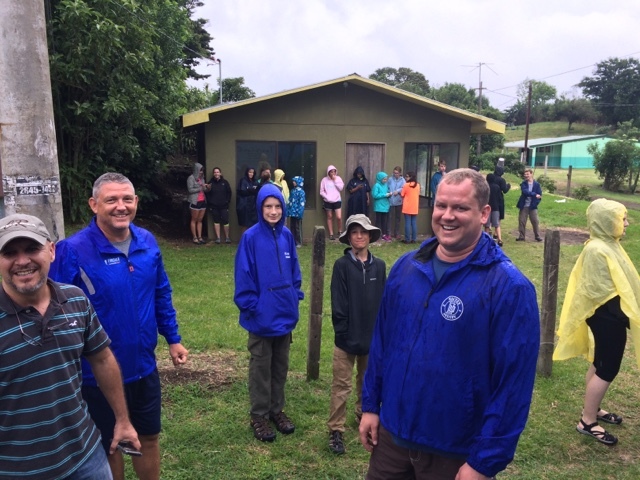 It will be a cool, wet day, but hopefully one that includes spotting a quetzal, jaguar, white-faced monkey, howler monkey or toucan.